Monitoring Vista’s CPU utilization can give you an insight into why your computer behaves the way it does, but only if you understand what you see. Fortunately, you can use the Resource Monitor to interpret Windows Vista’s CPU usage. The Resource Monitor is normally accessed through the Task Manager. You can open the Task Manager quickly by clicking Start, typing taskmgr in the Start Search text box, and pressing Enter. 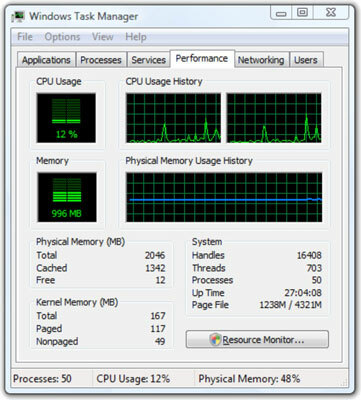 The Task Manager’s Performance tab tracks demand on your processor and memory, as well as other key resources. To get a better understanding of how your system is running, bring up Vista’s Resource Monitor by clicking the Resource Monitor button. The Resource Monitor displays a Resource Overview report like the one shown in the following figure. There’s an easy way to get to the Resource Monitor if the Task Manager is closed. Click Start, type perfmon /res (note that there’s a space before the / and no space after), and press Enter. CPU tracks the current processor usage in green, much the same as the Task Manager. At the top of the graph is a blue line that shows the processor’s maximum speed. That seems a bit odd (what, isn’t it 100% all the time?) until you realize that laptops, in particular, sometimes throttle back their CPUs to reduce battery drain. If your system seems sluggish and you can’t figure out which program is gobbling up all your processing power, check out the CPU component’s supporting list to see which processes are running, the percentage of CPU used by each process in the preceding 60 seconds, and a mess of other information. For example, in the following figure, the Desktop Window Manager (dwm.exe) used 2.38% of the available CPU cycles in the minute prior to the report being shown. To figure out which program is bogging things down, click the Average CPU column heading, and the sluggish process should float to the top of the list. Disk shows how much data is being written to and read from your hard drives. If you have more than one hard drive, the total amount of data being read and written for all drives appears here as the green line. The blue line keeps track of highest active time percentage. If your hard drive light keeps blinking and you don’t know why, check the Disk component’s supporting list. Chances are good it’s just the Vista indexer (SearchIndexer.exe), but if you find a process that you don’t recognize, start getting concerned about malware. Network shows how much data has traversed your network connection, in green, and the percentage of available bandwidth consumed, in blue. If you have only one network connection, the green and blue lines move in lockstep. Odd-looking network activity can be a sign of a worm or Trojan, but far more frequently, it’s just some program doing what it’s supposed to do. Don’t be overly alarmed by unfamiliar addresses. In the following figure, the address 224.0.0.252 may look suspicious, but it’s just the address that Windows uses to look up names on your local network. Memory keeps track of hard page faults — the number of times Vista has to go out to your hard drive to bring in “virtual” memory. The number of hard faults per second appears in green. The total amount of memory used appears in blue. In the best of all possible worlds, you should see very few hard faults — the green bar should appear very low on the graph. If your machine starts generating hard faults like crazy, you’re running out of memory. In the long run, the only thing that’ll help is more memory.